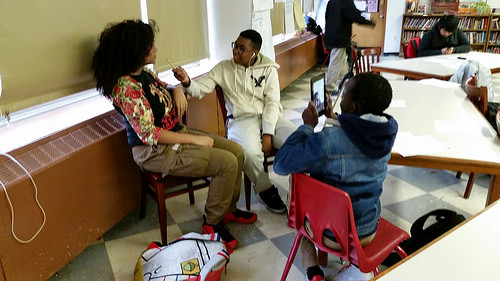 ​Seventh and eighth graders at Global Neighborhood Secondary School reached a key mid-year milestone before the December break: they completed their very first location-based games using the tool, TaleBlazer. Students collaborated in small groups to plan out and code the games, and to draw, photograph, and use image-editing software to create the art for the game. They also worked together to write their games’ stories. Students from the art elective joined the group for indoor and outdoor playtests, and provided valuable feedback for the youth game designers. 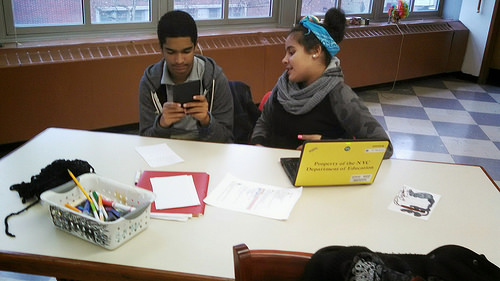 The focus project that students have been working on in 2015 is a location-based game featuring “ghosts” from El Barrio’s past. 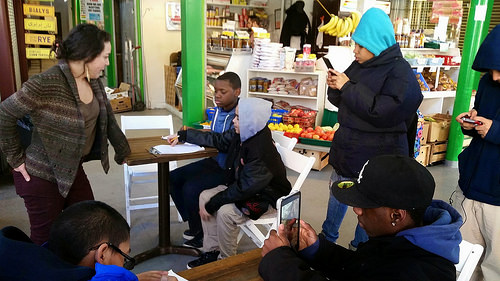 To prepare students to brainstorm the game’s location, characters, story and mechanics, we visited spots around the neighborhood, interviewing local residents and taking video and photographs. …and then put them to work out in the field. Here, one group interviews Nikki, who works for a bakery and job-training non-profit in La Marqueta. They also explored the neighborhood’s history through the completion of an El Barrio history timeline, and through examining old photographs. All of this background research culminated in students imagining characters that could have lived in the neighborhood over the last century, including Italian, Puerto Rican and Dominican immigrants. One group decided to create a location-based game about an Italian immigrant, set in East Harlem during the 1920s Prohibition Era. 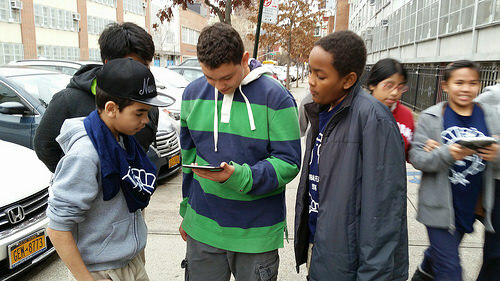 One group decided to set their location-based game in present-day East Harlem. That game is about a Dominican immigrant who has recently arrived in New York, and must complete “missions” to get settled in the neighborhood. 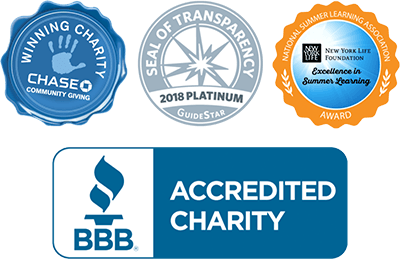 Looking forward to the finished projects, set to roll out in June!